I think every gamer loves the guys from CD Projekt Red. Beyond just being really nice guys with awesome Polish accents, they come out every now and then to say how they hate DRM and make their upcoming Witcher game sound even cooler. However, this latest announcement might just make some people rather confused. 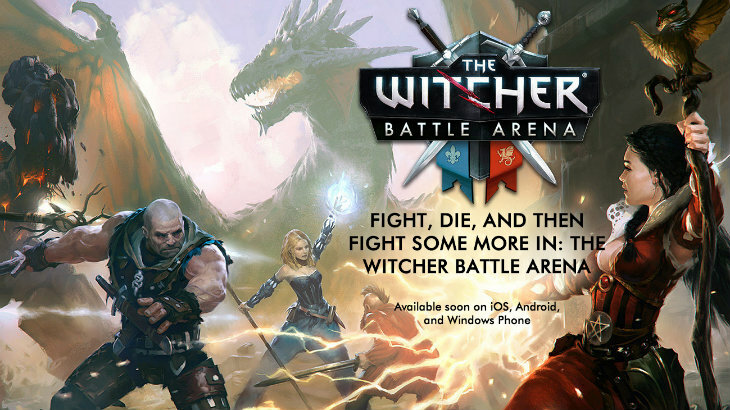 The Witcher now has a battle arena. Yes, a Multiplayer Online Battle Arena (MOBA) ala Dota or LoL. However, things get a bit different as it’s available soon, but only on iOS, Android and Windows Phone. Here is the teaser trailer for the game:. Everything in the game is unlockable for free, just by playing the game. Our system is honest, well balanced and doesn’t keep you playing for ages to unlock something. If you want to get something unlocked faster, you can purchase it for a reasonable price. It’s that simple. The game allows players to take on the roles of different characters from The Witcher universe. At the moment, these include: Eithne of Brokilon, Philippa Eihart, The Golem, Iorveth, Letho of Gulet, The Operator, Saskia of Aedirn, Zoltan Chivay. Using these characters (Heroes? Champions?) players can take part in 3v3 modes against each other, or group together against bots, or even play alone if the internet goes the way of our South African economy. Matches are quick – unlike the average 30 minute matches in LoL, these last a maximum of ten minutes, which is perfect for mobile gaming. Beyond the usual clashes that players are used to from MOBA, apparently there will be different modes, including a campaign. We will have different modes in the future. There will be a monster-hunting mode, kind of an isometric multiplayer. There will be a boss mode, where you will be able to fight the bosses – that will be purely a (player verses enemy) experience. And we are thinking of other competitive modes. We have a classic one-lane MOBA experience with towers, but we have a different approach because we don’t want to have minions, we don’t want to have farming. So, it all sounds quite unique and innovative despite the genre being so over-saturated. I’m sure everyone is still rolling their eyes on the other side of this screen – “ugh, another MOBA?” and all that. However, I think this game could actually work. Ten minute mobile fights that you can play with friends or on your own? This could be perfect for bathroom breaks (the usual mobile gaming time limit) and maybe even replace Hearthstone as people’s real game on mobile. I’ve been reading The Witcher books, there’s the game and the comics, so why not expand into mobile gaming? Are you guys fans enough to want to play anything from the CD Projekt Red guys, even if it’s on mobile? Or does this just seem like jumping on the MOBA/mobile bandwagon to you?